First a new George Costanza-themed bar opened up in Melbourne, Australia. 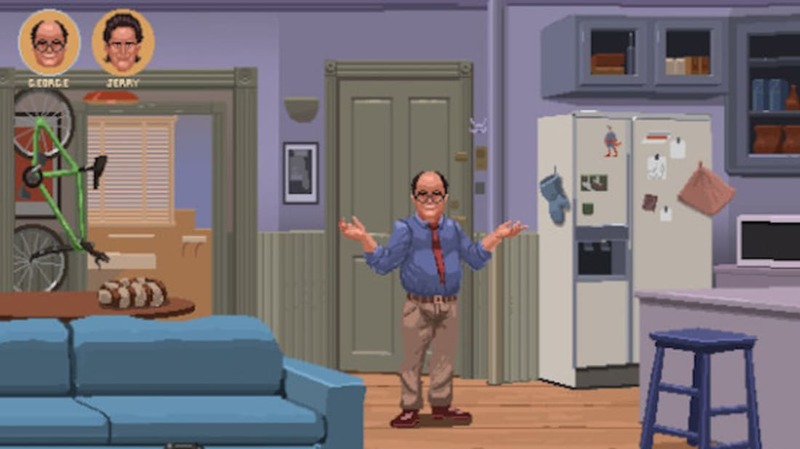 Now a new point-and-click Seinfeld video game is in the works. Game developer Jacob Janerka (who, coincidentally, is from Australia) quit his day job to work on his new adventure game, Paradigm. In the meantime, he’s also creating Seinfeld Adventure as a side project. The gameplay would be akin to an adventure game, following classic Seinfeld episodes like “The Contest,” “The Opposite,” and “The Soup Nazi.” However, gamers would be able to customize their own “episodes” with new storylines and adventures. Janerka emphasizes that it’s only a fan game for now, which would be made for Mac, Windows, and Linux systems, but he also hopes to acquire multi-platform licensing rights to make it mobile for iOS and Android. To give people a better idea of what he imagines the new game would look like, Janerka created a few images and GIFs. You can even see a big overstuffed wallet (full of sugar packets, hard candy, and other hilarious nonsense) in George’s back pocket from “The Reverse Peephole.” Look closely and you'll also spot a black-and-white cookie from “The Dinner Party” as a life meter, and a marble rye from “The Rye” on Jerry’s dining room table.